On December 30, 1873, John H. Kerr was born in Yanceyville. Educated at what is now Wake Forest University, Kerr began practicing law in Warrenton in 1895. After serving as town attorney and as mayor, he was elected judge of the Superior Court in 1916. Judge Kerr, as he was known thereafter, served on the bench until 1923. 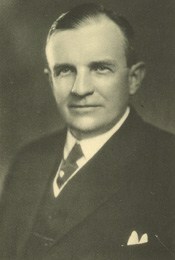 In 1923, Kerr was elected to the U.S. House of Representatives, where he would go to serve for 15 terms, until 1952. He was the third generation of his family to be named John Kerr and the third generation to be elected to Congress. In the House, Kerr was active on the agriculture, appropriation and public building committees. The Kerr-Smith Tobacco Act of 1934, which he co-sponsored, evolved into a program of price supports and allotments for tobacco farmers that would have a lasting legacy. Kerr is best remembered for seeking and receiving Congressional support in the 1940s for a flood control project on the Roanoke River. The lake created by the $100 million dam at Buggs Island, Virginia, was dedicated in October 1952 as the John H. Kerr Dam and Reservoir. Kerr had been defeated for re-nomination a few months earlier. He died in 1958.